BlackBerry Bold listed on AT&T web site | BlackBerry Blast! 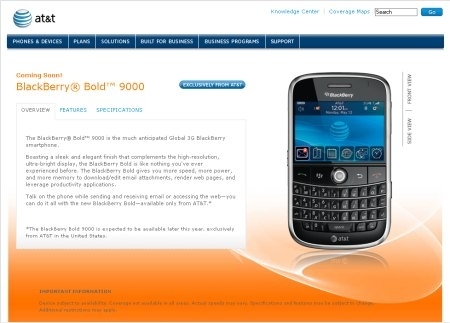 The upcoming BlackBerry Bold 9000 is currently listed on AT&T's web site with the words "Coming Soon." No release date is given although the site does say, "The BlackBerry Bold 9000 is expected to be available later this year, exclusively from AT&T in the United States."